Hi guys, Sport Witness here. 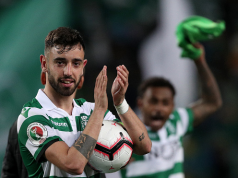 We know we’re your favourite website to go to when you feel all super excited about a transfer rumour, but you’re not entirely sure if it’s believable or not, so you come here to get your happiness shredded to pieces. So, if you’re here, it’s probably because you probably saw quite a few articles going around claiming that Inter, who are in the process of trying to get Ivan Perisic to sign a new contract, were trying to include an ‘anti-Manchester United’ clause in the deal. Either that or you really love us, and in that case, we really love you too. If you’ve read any of the articles in England claiming that Gazzetta dello Sport mentioned an ‘anti-United’ clause, you’ll notice that most of them contradict themselves. 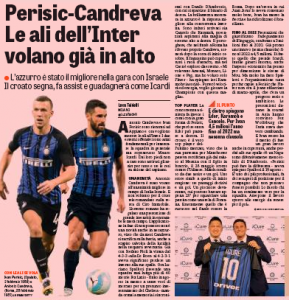 A lot of them will say “INTER SET TO OFFER PERISIC NEW DEAL WITH ANTI UNITED CLAUSE”, but will later explain that ‘no release clause’ will be included in the contract. The reason behind that is: it’s clickbait in its finest form. You might be thinking “Clickbait? In this day and age? Surely not? *shocked face emoji*”, but that’s the way things are. 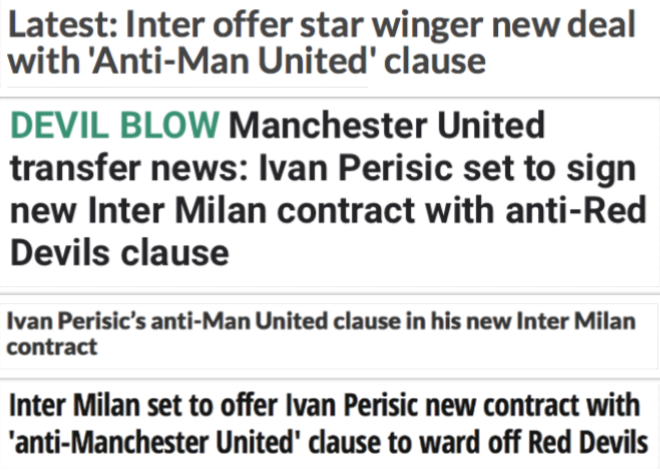 After all, sites need those sweet, sweet clicks from Manchester United fans, and the only way they can get them during the quiet period is by twisting headlines in their favour, which, in this case, is somehow managing to mention the Red Devils in news about Perisic. Also, before you call us hypocrites, sure, we’ve made some headlines sound more enticing than they actually were in our time, but when there’s nothing to cover, we tend to ignore it rather than create something out of nothing. 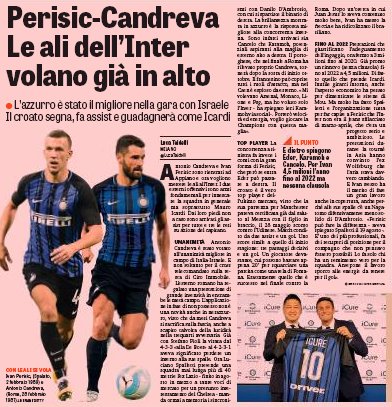 Going back to the Ivan Perisic article in Gazzetta dello Sport, we had a look at it this morning, and skipped past it because there wasn’t a lot to say, but, since it’s somehow made its way in the news, we’ll try and explain what happened. Basically, the Italian newspaper state that the new deal Inter are offering Perisic doesn’t include a release clause, which is what everyone is seeing as an ‘anti-Manchester United clause’. The mindset here is: if there was a clause, it would make things easier for José Mourinho to get his man, but if no clause is inserted, then it makes things quite difficult, as the Serie A side can reject whatever amount they feel like rejecting, thus it becomes ‘an anti-Manchester United clause’. You know that saying “to catch a criminal, you must think like a criminal”? Yeah, that works with clickbait, too. There won’t be an ‘ANTI MANCHESTER UNITED CLAUSE IN RED DEVIL SNUB AS SPECIAL ONE LEFT HELPLESS IN WINGER DESPAIR’ article from us. Just the plain, boring truth.